14 Harriers took part in very mild XC conditions. First female harrier home was Julie Banton and 1st Male Harrier home was Stephen Snow. Claire Moore and Will Ravenhill also had strong races both coming in 2nd home for the Harriers. A small Harrier turnout (2) on a very cold and snowy Sunday!! 1st Female Harrier was Kathryn Evans, and 1st Male Harrier was Duncan Smith. We managed to get 5 Harriers for this race but its quality rather than quantity!! 1st Male Harrier was Duncan Smith, and 1st Female Harrier Anne Newbury who have both been regulars at the XC races this year! Another strong performance was put in from Neil parry – top running! 10 Harriers turned out to do battle at Bosworth for the final race of the series. This was Sophie Cooks first XC race and she did brilliantly despite the SLIPPERY conditions!! Jon Wells made a very welcome back and put in a very good performance. 1st male Harrier back was Kieran Flannery who got a fantastic 11th place over all, and 1st female Harrier was our “Improver of the year” Paula Jennings! 22 Harriers took part in the first road league race of the season on a very undulating course hosted by the Stilton Striders. Trudi Unwin put in a great race finishing 1st Harrier lady, and Craig Free was our 1st male Harrier back. Racheal Trivett had a really great race and is showing fine form, and Dave Robinson also had a brilliant race running a PB!! This is a vey popular race with 27 Harriers taking part on a very sunny and warm Sunday morning. Nicki Nealon was our 1st Female Harrier home and was 2nd lady overall, and 1st FV45!!! Nick Strange had a great race and was 1st male Harrier home along with strong performances from Huge Potter, Dave Robinson, Helen Mercer, and Tina Tosh. Well done all! 3 great performances from our team of lady harriers – top running! Well done Karen who has now completed all 6 Marathon Majors – great achievement! And in wild, cold, and wet weather conditions!!! A stark contrast to the weather conditions in Boston the week before, the heat was very much turned on in the big city with the hottest London marathon on record! Well done to all our 12 Harriers who took part and managed to completed it in some great times!! Martin Coley was our first Harrier home despite looking like a ghost at mile 17, and Claire Surrell had a fantastic marathon coming in as 1st lady Harrier. Just to finish was an achievement in that heat so well done all! 22nd April 2018. Vienna Marathon. Well done to every Harrier that has taken part in race events this year and it is fantastic to see so many new faces getting involved! Thank you to everyone who completed the survey – we had over 50 responses and we intend to run the survey regularly to ensure that the club continues to meet the needs of you, the members. There were a wide variety of answers beyond the most popular answers listed below and the Committee have taken many of your suggestions on board. However, if there is something you would particularly like to see happen that hasn’t been addressed then please raise it with a member of the committee either at training sessions or via email to members@huncoteharriersac.co.uk. We asked: Why did you join Huncote Harriers? Wanting to improve your running – either generally or to train for a specific event (marathon, half marathon etc). A recommendation from someone they knew or knowing a current club member. The location – most local club. We asked: What would you like to see the Club do more of? More training variety and structure to sessions, particularly in the summer. Suggestions included different locations, cross training and longer runs. More coaching: in training sessions, one-to-one sessions, external coaches, and targeted for specific distances. More encouragement for runners of all abilities to attend races, track sessions, and cross-country including more information on the different leagues, taster cross-country sessions. More social activities including pub runs and 24 hour relays. Training Variety: We are in the process of organising some yoga/pilates sessions and hope to follow these up with some strength and conditioning training. The club will organise some more whole club sessions during the summer to improve the structure of summer training sessions – please look out for dates for these on the club web site and in the club emails. The coaches are also working to identify a wider variety of locations for winter training sessions. We have already organised a number of longer off-road runs at Bradgate Park on Sundays when there are no races and more are planned. More Coaching: Specific coaching occurs when training on the track or grass but is more difficult when on the road as athletes are often out of sight. The club can look at holding specific sessions i.e. more drills, speedwork etc if members would welcome this. Track Sessions: We have held track sessions on Friday nights from Jan 19th for 10 weeks, followed by a further block of 10 sessions that started in April. We will try and move this session to an alternative night if one becomes available. More encouragement for runners of all abilities to attend races, track sessions, and cross-country including more information on the different leagues, taster cross-country sessions: When advertising races or coaching sessions details are sent to everyone via Facebook and email, runners of all abilities are encouraged and welcomed. Information on different leagues is in the Harriers Guide and Fixtures page on the web site. More social activities: These are in the process of being organised including the usual post-Club Handicap BBQ, another 24 Hour Relay event, and some pub runs. Members are also encouraged to organise informal social events e.g. a drink after training. Other: There were also a number of suggestions around increasing the amount of kit, both for runners and supporters. Our new kit managers Jo and Will Ravenhill will look in to this, please do speak to them about your ideas. Bobble hats are already available. We asked: What would you like to see the club do less of? Encouragingly, the most popular answer was nothing! We have also invested in a new club tent, tea urns and more trained run leaders as well as reducing the number of events in the Club Grand Prix in response to some of the other points raised in answer to this question. We asked: What would you like to see the club do differently? The most common answer was again nothing! Variations to times of sessions: most people asked for later start times on a Thursday but there was one request for earlier sessions on a Tuesday. Improve membership process: there were a number of complaints about not receiving membership cards, particularly for those who don’t attend sessions regularly. More runs: weekend sessions, particularly around Bradgate Park or off-road. Having a middle group for training, one person was keen on Wendy and Ian’s splitting their group on a Thursday. Variations to times of sessions: the current times suit the majority of people and it is difficult to cater to everyone. We will continue to monitor this going forwards. Membership process and cards: we have now provided Club Membership Cards electronically and members can use these and their England Athletics card to receive discounts in shops and so on. Middle group for training: this is already happening to some extent and we will continue to do this when numbers require. Tuesday 23rd January 2018 saw the start of the very first Huncote Harriers Couch to 5K session. It had been decided late last year that Wendy Thompson and myself would organise a nine week C25K course. At the first planning meeting Ian Thompson joined the team and we felt 10 to 15 runners would just about make it worthwhile, 15 to 20 would be ideal and more than 20 would mean we needed more run leaders to help. On the first night 52 people registered, and Wendy had been told by the physio not to run! Needless to say there was plenty of help on offer from other run leaders and coaches, which remained the case throughout the course, and for which we are extremely grateful. The attendance gradually decreased over the first few weeks, settling down to a manageable 20 to 25 regulars. Initially the plan was to meet at 6.00pm on Tuesdays only, leaving the participants to organise two more runs each week for themselves. But as we were in the depths of winter and many participants had no experience of running, we felt it better to offer an additional Thursday session in order to keep the momentum going. Session one entailed alternating 60 seconds of jogging and 90 seconds of walking for a total of 20 minutes. On that first night 57 of us set off in the drizzle and headed off down the traffic free section of Mill Lane, as we did on most nights, armed with a couple of stopwatches and did our best to keep the group on track, shouting out “run” or “walk” at the appropriate time. We had the usual tongue in cheek accusations of cruelty as people were “being made to run for a whole minute without stopping”. At least I hope they were tongue in cheek. A few weeks later we were still being accused of cruelty, this time for being made to run for 25 minutes without stopping, a stark reminder of how far the group had come in such a short time. 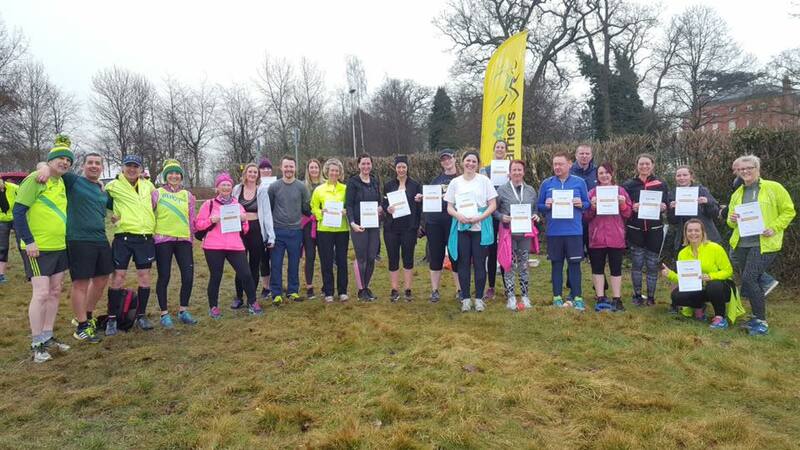 The target 5K was Braunstone parkrun on March 24th and 19 of our C25K group completed the run that day, followed by a further 3 over the next couple of weeks who were unable to attend on the 24th. Each finisher was presented with a certificate that Ben Benson had prepared. It was great to see so many regular Harriers there, especially Pearl and Beryl, as we gathered round the club flag to celebrate afterwards and tucked in to the biscuits, cakes and beer that had kindly been donated. At the time of writing 17 of the C25K graduates have joined the club and a few have already returned to parkrun and achieved new PBs. I’d like to thank everyone that helped (sorry – can’t name you all here) and to say how enjoyable the whole experience was. What a nice group of people to work with and get to know, thanks everyone! To welcome the spring a social gathering at the Limetree in Whetstone. Hopefully it will be warm enough for us to be in the garden. Friends/partners welcome or come down on your own. Following last years success we are planning to host the 24 hour relay. Currently waiting for confirmation from the rugby club about having the club from the Friday night so we can have a relaxed social evening before starting the relay on the Saturday. Details to be confirmed. We plan to meet at a local(ish) pub for a summer pub run on a Thursday evening. This will be for all groups. Dates to be confirmed when we’ve found a suitable pub and run route.